My husband and I moved in together in 1997. I was 21 and we were both in college. We had a 1 bedroom, 5th floor walk-up on Amity St. for $1,000/month that we split. I bought my first pasta pot at Winn Home & Beauty. I was just starting to cook. A few years later, when I forgot about a pot of steaming green beans and scorched the bottom of the pan; I bought my second pasta pot at Winn Home & Beauty. I called it the junk store. My mother-in-law actually complimented my generic pasta pot once and asked where I got it. I told her the junk store on Court Street. I didn’t know the name and how else to categorize it. She replied, “Oh yes. I know exactly what kind of store you’re talking about. You always get the best pots at those places.” I still use the same pasta pot. Everything in the Store is 50% off!! It is with much regret to say that after 26 years Winn Home & Beauty will be closing its doors. Due to the store closing we must liquidate all our merchandise. Our store hours are 9am till 8pm EVERY DAY!! So, today, I picked through the vast and varied remnants of Winn Home & Beauty along with many of you. The register was humming. I have never seen that store as busy on a Monday, let alone a weekend, in the past 19 years that I have known it. The employee at the register remarked that there had been a consistent line for the past hour. And why wouldn’t there be?! Where else can you buy toaster tongs and selfie sticks in the same place as underwear and lightbulbs? Where else can you buy Riedel wine glasses and Christmas ornaments in the same place as screwdrivers and hair gel? While on the lengthy line to the register with my toaster tongs and nail polish, pondering whether I really needed a 50% off moleskin notebook, a steady stream of well wishers professed their fondness for this variety store. Both young and old, and as varied as the merchandise, these customers expressed with great sincerity how much they would miss Winn Home & Beauty. And now that I think about it, variety is truly the word for this place. Winn Home & Beauty is not a junk store; but rather a true variety store; a true embodiment of Brooklyn, of New York. It is a place where the toilet seats reside next to the coffee pots. It’s a place where the yoga mats are logically back by the aluminum chafing dishes. At Winn current Halloween, mingles with leftover Christmas, Valentine’s Day, Hanukkah, and sometimes St. Patrick’s Day and that’s just fine. Socks live next door to spray paint and candles. However, my most vivid memories of Winn Home & Beauty have nothing to do with the humorous juxtaposition of merchandise. And I suspect you have similar memories as well. My husband and I eventually moved out of our 5th floor walk-up and had children. We strolled them past Winn Home & Beauty countless times. As soon as the children were intelligent enough to point, they always demanded we stop at Winn’s coin operated horse and motorcycle. I spent many afternoons digging for my last quarters to pay for these totally boring rides. I said no to their requests just as often as said yes. And yet, today as I saw the amusements truck assessing the horse and motorcycle for removal, I have to say I got a little sentimental. 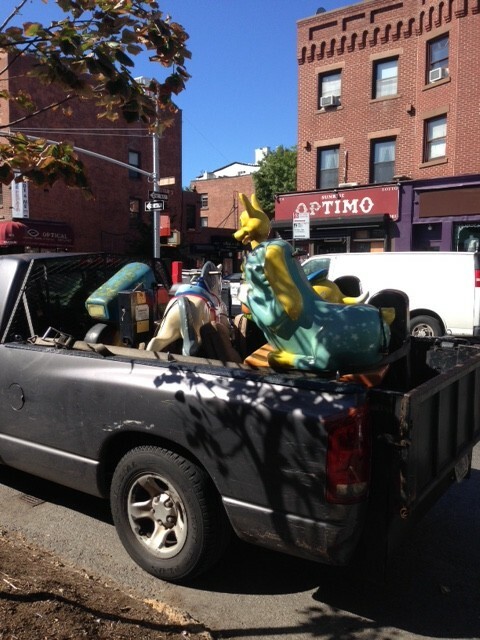 It looked like there wasn’t enough room on the truck so the rides have been left there for now. Perhaps I’ll have to keep my generic pasta pot. Perhaps I’ll have to let my youngest ride the horse one more time before it disappears. Winn Home & Beauty, are you the last of the local variety stores? Perhaps, but stay tuned. The rumor is the owner is hoping to revamp and reopen. I hope they do. They’re coming to take the rides!